Disclaimer: The entire write-up comprises of the methods to open, view OST file in Outlook or read OST files without Outlook. Moreover, the entire content primarily focuses on the methods to open OST files in Outlook 2016/2013/2010/2007 and below editions manually and by using Outlook OST to PST Converter tool. Outlook is a renowned email client that is used to access the Exchange Server mails. It not only offers the access to Microsoft Outlook to Microsoft Exchange server, but it even comprises of contacts, calendaring and task management facilities. Many companies can also access Microsoft Outlook with the Share Point platform for sharing documents, sending reminders, project notes, and many other things. It can even be used as a stand-alone application for performing different tasks. The source code for MS Outlook is written in C++ language and works well with the Windows Operating System. Before just jumping to the section where we need to view OST files in Outlook 2016/13/10/07, go through the segment below and get a brief understanding of OST files. If a user uses Microsoft Exchange account, all the emails, contacts, calendars, and other matters can be delivered and then stored on a server. Users can even configure Outlook and then make and save the replica of the data on a system within the Outlook OST files. While performing the task, users are subject to using the Cache Exchange Mode in offline mode. The Offline .ost files can always sync with the MS Exchange computer when the connection is available. The Microsoft Offline folder is basically a copy of the files found in a mailbox, but on the computer, comprising of the MS Exchange. It can be considered easy to take the folder from one location present on the server and works well with the files when it is not connected to the network. The moment users have connected to it again, the file is updated on the respective server folder make them match. The entire process can be considered for synchronizing files and the folders. The users can even add, delete, or modify the content of offline file/folder. Users can send the messages that are included in the offline Outbox. Also, the users can even preview the matter of offline public files. Additionally, all the new messages have been kept in Inbox that is present on the server, and even all other people can add, modify, and delete the content present in the public folders. The users are completely unaware of the changes till synchronization of the server can be done. 2. Full items: The Full item even contains a header, message body, and the attachments, i.e., embedded objects, pictures and many other things. The below segment will help you with the terminologies to view OST Files with or without Outlook. So, gear up and read the below section thoroughly. Microsoft Offline OST files can be synchronized with the data present on the server with Microsoft Exchange. All data remains on the Microsoft Exchange server. The users can make a .ost file in the system without taking the backup of the previous file. Moreover, to view the OST File in MS Outlook 2016/13/10/7, users need to know the storage location of the OST Files. 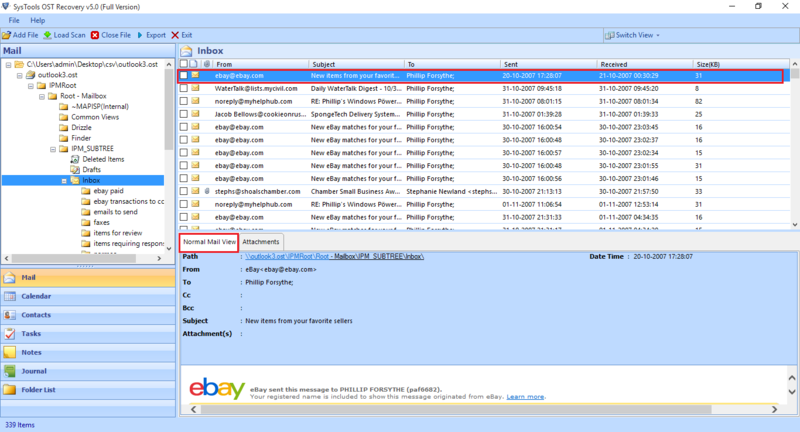 Listed below are the few storage locations which can be used to easily view Outlook OST files. Now, let’s go to the below write-up segment where we will come across two sub-sections in which users will come across two methods i.e., view OST file in Outlook and read OST File without MS Outlook. To read OST file in Microsoft Outlook, the users need to move the OST file to PST first. So, listed below are the methods through which the process can be completed. Note: The export process of OST to PST 2016/13/10/07, the method is only applicable in case the users are connected to the Exchange Server. Note: Using this manual method, users can transfer the OST file data except MS Outlook Address Books and view OST file in MS Outlook. Tip: Though the above method is reliable, but cannot drag entire Inbox, Calendars, Address Books, Sent Items etc to Outlook PST. Therefore, only copy a folder from OST file to PST. If the case occurs where you make use of all the three methods mentioned overleaf, and still you are not able to import Exchange Mailbox to Outlook PST, then without wasting a single second, make use of a third party program to export OST to PST easily and without any hassle. By converting the OST files to PST via three methods, the users can view offline OST files easily and that too without making use of any automated solution. Now, Reading MS Outlook OST Files is easy by making use of an Expert Solution i.e., OST Viewer Tool to View OST files without MS Outlook. Let’s have some insights of the program. The entire method focuses on how to view OST files of 2016/13/10/7 and the below versions. Users can follow the manual and alternate methods to read OST file in Outlook as per their requirement.